In the section entitled Tourism, the National Environmental Action Programme envisages directing practices towards the development of tourist supply which will take great consideration of natural and cultural identities in marketing. One of the targets identified within the Biodiversity Conservation Strategy in Slovenia is the creation of a more balanced and sustainability-oriented tourist supply incorporating outstanding natural features and taking into account the potential of the entire country as well as the threat to individual outstanding natural features. The indicator shows development in the tourist popularity for selected outstanding natural features in Slovenia. Visits and number of entrance tickets for visits to outstanding natural features also depend on their presentation and organisation. In the period 1992-2004, the total number of organised visits more than doubled. The number of sites arranged by responsible operators for tourist visits is also increasing, thus enabling safe and guided experience of outstanding natural features and at the same time, the latter’s protection from excessive loading. This is especially important in sensitive habitats such as karst caves. 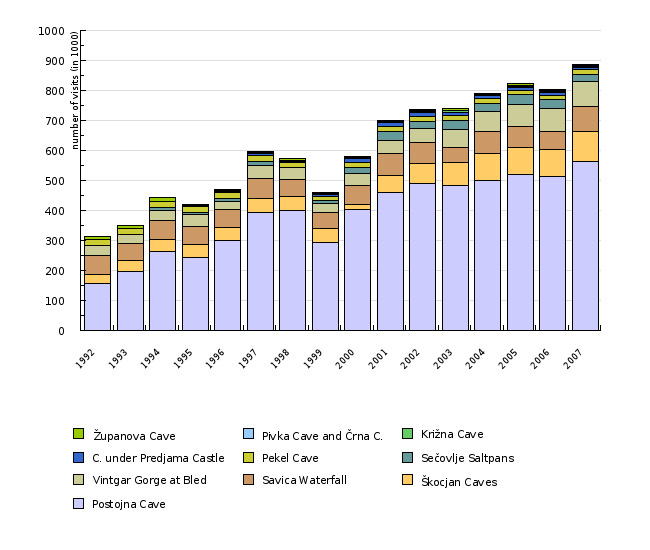 By granting a concession to the operator of the Postojna Cave (Decree on the Concession for Utilisation of Valuable Natural Features of the Postojna and Predjama Cave Systems, OJ RS No 77/2002), a step forward in the realisation of the National Environmental Action Programme envisaging the introduction of assigning concessions for tourist consumption of natural resources has also been made. In the year 2005 the entrance ticket to visit one of the natural features in Slovenia was paid by 822 thousands visitors, a little less in 2006. By far most visited natural feature is the Postojna Cave. The source of data is notices in publications, Results of surveys and Statistical information 21 by the Statistical Office of the Republic of Slovenia. The data have been aggregated through collecting reports on tourists visiting tourist sites, casinos and swimming pools that are communicated to the Statistical Office of the Republic of Slovenia by managers of tourist establishments in respect of the number of entrance tickets sold. Visits to Selected Tourist Sites, Casinos, Swimming Facilities, Museums and Galleries, Results of Surveys, 661/1996, 681/1997, 708/1998, 736/1999, 738/2000, 745/2001, 771/2002, 787/2002, Statistical Office of the Republic of Slovenia; Visits to some Important Tourist Sites, Casinos, Swimming Pools, Galleries and Museums, and Number of Days of Operation, Slovenia, Statistical Information 21, 148/2004, 73/2005, 47/2006, 25/2007, Statistical Office of the Republic of Slovenia.